Firstly, I grew up watching The Hoff, I loved 'Knight Rider' (still do if I'm honest), I liked the early 'Baywatch' episodes and even more so it's spin off 'Baywatch Nights' (not so much the second season though). I always liked The Hoff in general and while people might say he's not a great actor or a great singer, what he does have is some great taste in music. For example, 'Baywatch', for which he was very hands on regarding the soundtrack, introduced me to the likes of Jimi Jamison, and featured music from bands and artists who I ended up really loving – Jimmy Barnes, Noiseworks, ZZ Top, Treana Morris (who would go on to work with Roger Taylor from Queen and front The Wire Daisies) – I heard them all on 'Baywatch' first. The Hoff himself also contributed vocals to several tracks on the 'Baywatch' album, all of which were gems, but when you look at the credits and see the songs were co-written by the likes of Richard Page, Jeff Paris and Kevin Savigar, that shouldn't be surprising. After purchasing the 'Baywatch' album, I bought a couple of Hasselhoff records, thinking they'd be in the same vein. Unfortunately, that's not the case... but 'Night Rocker' firmly fits in my "Guilty Pleasures" file. 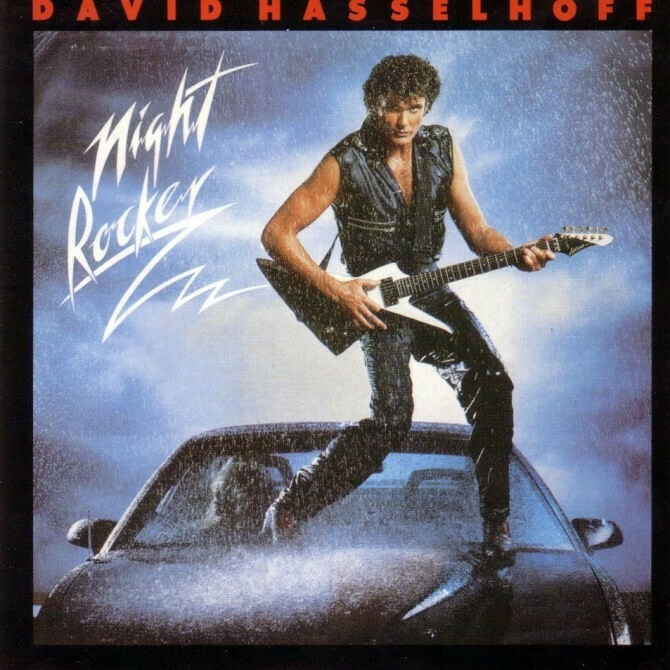 It was Hasselhoff's debut as a singer and it received some promotional help from an improbable episode of 'Knight Rider' called 'Let It Be Me' which featured Michael Knight going undercover as a Rock singer, dressed in ludicrous shiny mid-eighties garb and performing three tracks that would ultimately appear on this album. In America and the UK nobody gave a toss and Hasselhoff thought his dream of being a Rock star would stay just that... until he met a young girl who told him "your album is number one in my country". He immediately said "Where is your country?" and the answer was, no, not Germany, but Austria. The Hoff, to his credit, immediately booked a tour there to capitalize and took a replica of KITT with him to drive onto the stage, stating modesty "If they won't come for me or the music, they might come to see the car". So that brings us to the album itself, which sees Hasselhoff stood on the bonnet of KITT, posing in leather and advertising what would surely be an eighties Metal album. Not quite... the excitingly named title track is more piano-led Pop-infused Rock 'n' Roll with a saxophone solo, which Hoff remarked years later is "the worst song ever recorded". I disagree, I can name many worse (included some contenders from subsequent Hoff records) but it's far from the album's high point. 'Crazy On A Saturday' is twee Pop fodder, but annoyingly catchy, while the cover of The Contour's 'Do You Love Me' is entertaining and the Hoff makes a decent fist of it. Things pick up with the parping 'First Night Together' which boasts a cheesy, yet infectious hook and sees vocal duties shared with Hasselhoff's then wife Catherine Hickland. 'She Cried' is another decent cover which The Hoff handles with style, before the frankly excellent 'No Way To Be In Love' sets the Rock pace. Co-written by Glen Ballard, who had previously worked with The Pointer Sisters and Michael Jackson – and would go on to work with Alanis Morrisette, Van Halen, Aerosmith and countless others – Hasselhoff clearly enjoys himself here and it's probably the best track on the album. 'Any Kind Of Love At All' is a somewhat schmaltzy, lighter-waving affair but well sung by The Hoff, before the Martin Briley penned Rock effort 'All The Right Moves' allows Hasselhoff to get feet tapping again. 'No Words For Love' is, for me, the strongest ballad on offer and features Hasselhoff's best vocal on the record, while the duet with Hickland on The Everly Brother's 'Let It Be Me' is inoffensive and solid. The success in Austria backed by touring subsequently saw the record chart at #30 in neighbouring Germany, where Hasselhoff would achieve superstardom with his second album 'Looking For Freedom', released just as the fall of the Berlin Wall was taking place. He famously performed the title track on the wall, resulting in a Number One album. That signaled his move into more Pop territory, selling plenty of records in Switzerland, Holland and France as a result. His subsequent output was, as a result, synth-heavy Euro-Pop in style which meant, as far as I was concerned, his finest recorded work in terms of quality would be the songs he contributed to the 'Baywatch' soundtrack and his 2004 album 'Sings America' which saw him traverse into the Easy Listening genre via a series of strong covers of well-known American songs. However, for where it all started, if you want the leather jacket clad, head-band wearing Hoff, 'Night Rocker' is the album to find him. Cheesy? No doubt. Eighties? For certain. Fun? I certainly think so.